"The Prince Who Never Smiled" is the 37th Mandrake Sunday story. The story was written by Lee Falk and drawn by Phil Davis. Duchess Natalia loves King Ferrand of Ferna. But the widdower King is so unhappy about his little son who never smiles, that he can not think of nothing else. Mandrake promises Narda that he will try to make Prince Randy smile, so they all could be happy. Natalie, Duchess of Kort. Narda's cousin. 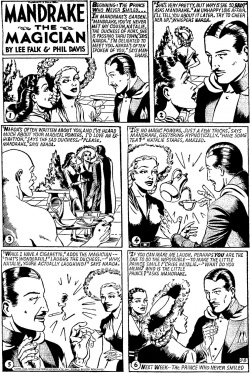 The title for this story is taken from the strip of February 1 and 8, 1948 (Beginning Next Week = The Prince Who Never Smiled & Beginning: The Prince Who Never Smiled...).